A study relating to the Church Order does not seem so very relevant or helpful to the questions we face in the daily lives we’re given to live. What, has the government of the church got to do with our labours in the factory, our responsibilities with our children?! Is church government not simply a minister’s speciality – a field of study with which we need not burden our brains? Come to think of it, is church polity not simply church politics…? No, church polity is not church politics. Granted, in the church of the Lord too many situations (of the distant and the not so distant past) have wreaked of politics, and I am embarrassed that it is so; in the church of Jesus Christ there is room neither for politics nor for politricks. And I grant also that the sins of leaders (of the distant and the not so distant past) have eroded confidence in the value of church polity. the accent ought not to be on how things have been done, but rather on how things ought to be done. As we look to the future, then, let us together consider what the Lord has told us in His Word about how He would have His church be governed. It is a given of Scripture that God is sovereign over all. I read in the Psalms that “the kingdom is the Lord’s, And He rules over the nations” (Ps 22:28); “He is a great King over all the earth” (Ps 47:2); “the Lord has established His throne in heaven, And His kingdom rules over all” (Ps 103:19), etc. As a result, we confess Sunday by Sunday that “I believe in God the Father almighty, Creator of heaven and earth”. He who created the world in the beginning – He’s now my Father in Jesus Christ- still rules the world sovereignly today. After Christ’s triumph over sin and Satan on the cross of Calvary, God “put all things under (Christ’s) feet …” (Eph 1:22). To have things ‘under one’s feet’ means to lord over them, to have these things in subjection to you (cf Josh 10:24f). So Jesus could say before His ascension into heaven: “All authority has been given to me in heaven and on earth” (Mt 28:18). Note how comprehensive these two statements are: the ascended Christ rules over all things. This includes not just secular governments and authorities, but also His Church. That is why the Scripture tells us that Jesus Christ is the Head of the Church, which is His body (Eph 1:20-23; Col 1:18). Since Christ is the Head of the church, it follows that in the church of Jesus Christ things are to be done Christ’s way. We confess this truth in the Belgic Confession with these words: “We believe that this true Church (this is the Church as confessed in the previous articles) must be governed according to the spiritual order which our Lord has taught us in His Word” (Article 30). Similarly, “We believe that, although it is useful and good for those who govern the Church to establish a certain order to maintain the body of the Church, they must at all times watch that they do not deviate from what Christ, our only Master, has commanded” (Article 32). The church belongs to the Saviour, and precisely for this reason it is imperative that we -who by God’s grace may belong to His church- see to it that His Church is indeed governed according to His Word. A church that confesses Christ’s sovereignty with the mouth, but does not honour Christ’s sovereignty in the concrete deeds of church government, is not faithful to the only Master. How Does Christ Rule His Church? Christ has taught us in His Word how He rules His church. We confess it in LD 12.31: He “governs us by His Word and Spirit”. With the help of a couple of big words, I want to make a distinction here. Christ, I’m convinced, governs His church by His Word and Spirit ‘immediately’ and ‘mediately’. The first of these two big words captures the notion that Christ rules without any intervening means. (In the word ‘immediately’, ‘im’ = no and ‘media’ = means. So ‘immedia’ = no means.) Christ rules His Church directly by His Word and Spirit, without using particular tools. Through the school of life, Christ works directly upon His people to make them grow in faith, even in spite of the sins and weaknesses of the office-bearers. We may think here of a passage as Hebrews 12: “If you endure chastening, God deals with you as with sons…. He [chastens] us for our profit, that we may be partakers of His holiness” (vss 7ff). On the day of Pentecost, the Holy Spirit was poured out not on the twelve disciples only, but on all believers. As a result, the apostle could write to the entire congregation in 1 Peter 2:9, “But you are a chosen generation, a royal priesthood, a holy nation, His own special people….” Similarly, Paul asks each member of the church of Christ in Corinth: “do you not know that you are the temple of God and that the Spirit of God dwells in you?” (1 Corinthians 3:16; cf 6:19). With the gift of the Holy Spirit, all Christians have been anointed to the ‘office-of-all-believers’. We are, then, all prophets, priests and kings. We are called Christians because, as we each confess, “… I am a member of Christ by faith and thus share in His anointing, so that I may as prophet confess His Name, as priest present myself a living sacrifice of thankfulness to Him, and as king fight with a free and good conscience against sin and the devil in this life, and hereafter reign with Him eternally over all creatures” (LD 12.32). Since we all share the office of all believers, we all have a place and task in the congregation. True, we all have different gifts, and so we have the privilege of complementing each other. As we read it in Romans 12:4-8, “For as we have many members in one body, but all the members do not have the same function, so we, being many, are one body in Christ, and individually members of one another. Having then gifts differing according to the grace that is given to us, let us use them: if prophecy, let us prophesy in proportion to our faith; or ministry, let us use it in our ministering; he who teaches, in teaching; he who exhorts in exhortation; he who gives, with liberality; he who leads, with diligence; he who shows mercy, with cheerfulness”. In the capacity of the office of all believers, we all may be tools in the Saviour’s hands through which He cares for His church. It pleases the Head of the Church, though, particularly to use special offices. When Christ ascended into Heaven He gave special gifts to some people so that, in addition to serving in the office of all believers, they might also be enabled to serve in the special offices. “And He Himself gave some to be apostles, some prophets, some evangelists, and some pastors and teachers, for the equipping of the saints for the work of ministry, for the edifying of the body of Christ, till we all come to the unity of the faith and the knowledge of the Son of God …” (Eph 4:11-13). As Paul also says to the elders of Ephesus: “Therefore take heed to yourselves and to all the flock, among which the Holy Spirit has made you overseers, to shepherd the church of God which He purchased with His own blood” (Acts 20:28). Church Polity does not concern itself with Christ’s ‘immediate’ governing of His Church. Church Polity does not concern itself either with how individuals carry out the office of all believers. The focus of Church Polity is instead the special offices. The Lord of the Church has revealed in His Word particular principles concerning the way He wishes things to be done in His church. Where His will on a given matter has been clearly revealed in Scripture, the Lord’s churches have no option but to act accordingly. The church must, for example, have office-bearers. A church must also exercise discipline. Still, precisely how a church goes about obtaining office-bearers, or how office-bearers go about exercising discipline is not set forth in Scripture in non-discussable detail. Certain principles are revealed, to be sure. But details need to be extrapolated from these principles. The question that then arises is this: should the churches all go their own way in determining how they shall work out the applications of Scriptural principles? Shall one church call to office via one procedure and another via another, or one church exercise church discipline in one style and another via another? Should the churches, for that matter, be granted the liberty to change their practices year after year, according to the taste of the day? The Lord has revealed in Scripture that He is a God not of “confusion but of peace” (1 Corinthians 14:33). Instead of haphazard approaches to a given aspect of church life, “let all things be done decently and in order” (vs 40). That there be an agreed-upon way of doing things puts the brakes on pushing to get one’s own way and it serves also to restrict opportunity for needless argument – both of which produce division. An agreed-upon way of doing things produces stability, and stability encourages peace and therefore growth in the congregations of Jesus Christ. Church polity busies itself with fleshing out in practical formulations the principles Christ has revealed in Scripture about how He wishes things to be done in His Church. Since these practical formulations (they are the articles of the Church Order) are not so much lifted verbatim from Scripture as deduced (for good reasons) from the principles of Scripture, one cannot consider these formulations to be laws in the strict sense of the word. Rather, these formulations are agreements which –when one adopts the Church Order- one promises to maintain. That is why Reformed Church Polity does not ask one to submit to the Church Order (as one would to a government or to a set of laws); Reformed Church Polity instead asks one to keep one’s promises – which, of course, a child of God is most eager to do (see Psalm 15:4). Since these agreements are built on principles drawn from the Word of God, one must -if one would do justice to a study of the Church Order- pay attention first to the underlying principles. 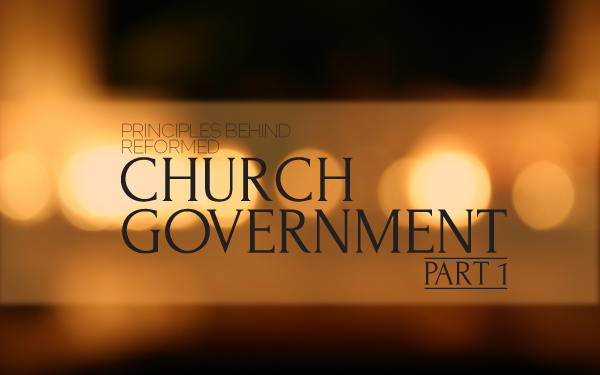 This is part 1 of a 4 part series on Church Polity.